The year was 1966 and I was a newly assigned machine gunner in an infantry unit that was protecting a high mountain pass that was between Da Nang and Phu Bai, Vietnam. The pass is called Hai Van Pass, which means Place of the Clouds. It is located 30 km north of Da Nang. The Marine Corps name of the hill that my unit was on was Hill 724. It was a dangerous and treacherous area that was of high strategic value. 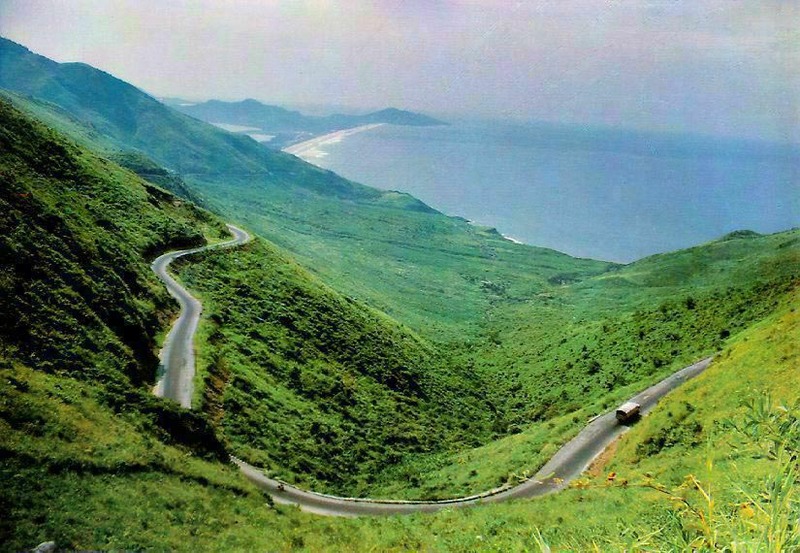 There was only one narrow highway that wound up steep cliffs (Highway 1) that reached the peak at Hai Van. At the base of the hill was a small village called Namo. My story starts in that village. On a patrol through the village, my squad noticed a small wooden cage outside of a hooch. We were new to Vietnam and unaware of the customs of the people. We were always alert for booby traps and we moved closer to the cage. Inside the cage was a small, brown puppy that brightened up when he saw us approach his cage. He began wagging his tail and wanting to be held. It was love at first sight for all of us. Don't tell anybody, but most Marines are real softies when it comes to animals. The owner of the hooch came out and I decided to offer to buy his puppy. I just didn't like his living conditions. The old villager started his trying to up the price and after much debate, he decided on a price. He then pulled out a sharp knife and proceeded to open the cage. All of us were shocked that he pulled a knife out and we all raised our weapons to him. He looked very frightened and assured us that he meant us no harm. He explained in gestures that he was just going to prepare the dog for us. We were confused and then he made the motion of drawing his knife across his neck to tell us that he was going to kill the dog and dress it out for us to Chop-Chop. I can only tell you that the anger level went up 100 notches at that suggestion. We then realized that the dog was being raised to eat by the villager. I unbuttoned my flak jacket and reached in and took the dog from his hands. I threw the money on the ground and placed the pup next to my heart so I could carry him up the long torturous climb back to our base camp. The first event that happened was all of us knew that it was going to be a challenge to get our superiors to allow us to keep him. It was a miserable walk back to our hill. Our fears were baseless because we had a wonderful Captain, named Capt. Silva, and he allowed us to keep the puppy as a mascot. We loved him before, but we really loved the Captain after that. Next we had the heated debate on what the dogs name should be. It was not an easy process since marines are very bull-headed and strong willed. After much serious and highly intelligent discussion we arrived at the unique name of Brown Dog. You have to know Marines to appreciate this. Brown Dog was the darling of the hill and only one Marine hated him and that was OK, because we all hated him too. We all decided that if Brown Dog didn't like him that there had to be a damn good reason. Later he proved to be a coward in combat and was removed from our hill before he had an Accident. Brown Dog was very happy that he left. I lost a stripe because I caught this guy kicking at Brown Dog and I explained to him not to do that again. I explained a little too harsh and the 1st Sgt. explained to me the error of my ways. Brown Dog had a ritual of his life on the hill. At night we were in bunkers staring out into a dark, fog filled jungle. We were issued Seismic Listening Devices which consisted of probes planted in the ground in front of our bunkers. We had a small console inside that had earphones. We could hear footsteps approaching or animals moving. We got pretty good with the device. Brown Dog would make the perimeter of our positions and visit every bunker to check on His marines. He was always a welcome visitor and he spent all of his non patrolling time in his daddys bunker, MINE! He also went on patrols with us and had an intense hatred for the Vietnamese. He would growl and really act up when he would see or smell one. On April 1, 1967, we were dug in and the fog was pea soup thick that night. I was in the machine gun bunker and we were really spooked. About 3 am Brown dog shot up and went on full alert. I rang the field phone and informed the Command bunker that Brown Dog had alerted. Our Lt., ( Naval Academy IDIOT) advised me to trust my Seismic Device and not a damn dog! My bunker was the forward bunker and the most vulnerable. I looked at my machine gun crew and whispered that I was going to disobey the Lt.s stupid order. They all nodded as I prepared the pop-up flare to shoot into the sky. I popped the flare and Lo and Behold we had Beaucoup Gooks in the wire! All hell broke loose and it was a very violent battle that night. It was up close and personal fighting and many people on both sides were killed and wounded. Brown Dog was hit by shrapnel but continued to fight the enemy. I saw him attack the leg of a NVA before he was zapped. The attack failed and for what seemed like an eternity, we waited for the sun to come up. There were dead people in the wire, burning, and moaning out in pain in the darkness. I held Brown Dog in my arms and awaited the medivac helicopters that were coming to help our wounded. I really thought Brown Dog was going to die in my arms. When the choppers came I handed my baby to the door gunner and asked him to get him medical help and told him that we would all be dead if it wasn't for Brown Dog. Marine to Marine, he gave me his word and I watched the dust-off. My Capt. pulled me aside and told me that he was glad that I never followed orders. He rubbed my head and told me that he was going to call to headquarters and tell them the story and he ASSURED me that Brown Dog was going to get the best of care. Brown Dog had lost a lot of blood so I really didn't have much hope. The next day we received word that Brown Dog had been taken to Army Vets and they had saved his life. He had over 100 stitches, needed blood and antibiotics but he was going to live. He was the hero to all of us. He received a canine award for heroism and we promoted him to Cpl. I also got my stripe back much to the chagrin of the Lt.
Cpl. Brown Dog returned to a heros welcome as we had a full formation to welcome him home. I left the hill June 9th, 1967 and he was in very good hands with the Marines on the hill. I tried to take him home but that was impossible. I really hurt having to leave him on the hill, but I knew the Marines would take excellent care of him. I have always thought it was so ironic that once he was going to be eaten by the Vietnamese and in turn he caused the death of so damn many of them! All of my friends still have his picture and we all know that we would not be here today if it were not for a little, mixed breed dog named Brown Dog. He will be in our hearts until we die and a part of our souls forever. When we assemble for our reunions, we always toast Brown Dog. Rest in peace little Warrior and wait for Your Marines to join you. We will always be Semper Fidelis to you and your memory. A Salute and three cheers for the finest Marine on our hill! The above story came through the internet to my Email today, 4-25-06. It is a tale that at least half of the warriors alive today can relate to and I am sure could tell us a similar experience with a stray dog who became Mascot of a tent, foxhole, squad of troops, platoon, company, or battalion. During my 24 years it happened more than once. Tramp was a three legged brown dog and the Mascot of VMA(AW)-533 in Vietnam. The troops smuggled Tramp into MCAS Iwakuni, Japan when the squadron rotated out of Vietnam around 1970. I arrived as Commanding Officer of the squadron in 1971 and Tramp treated me like any other FNG boot that came aboard. I had to show myself worthy of being a Night Hawk in 533. Tramp was married to a four legged dog named Hubert who produced pups for Marine Unit Mascots. Good work by Tramp on one hind leg! John McNamee provided these pictures of Tramp and Hubert taken in 1972 after 533 began flying combat missions from the Rose Garden in Nam Phong,Thailand. Tramp accepted me just as he did every FNG. 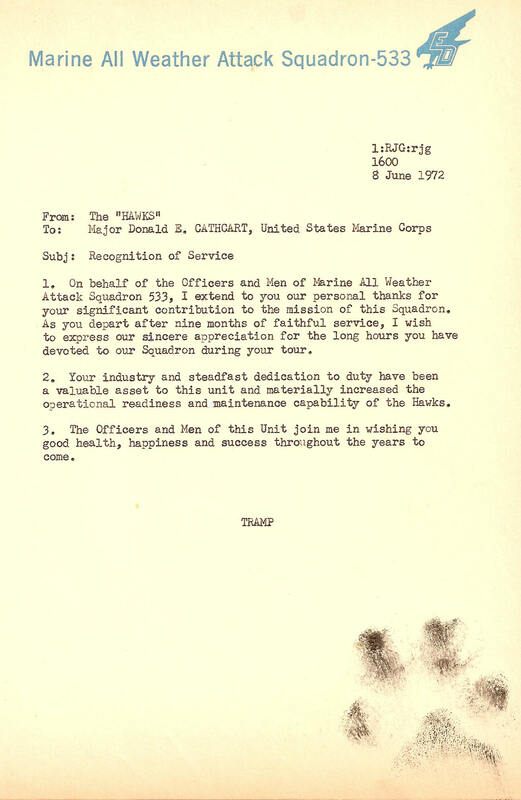 In fact, when I separated from the squadron in June 72, Coy Cline and his administrators drafted a Mast citation which Tramp signed. I have kept that citation all these many years because it probably is the only such document in existence. pleasant journey I enjoy to that lofty aerie where Tramp awaits us all.